We’re used each day to deal with products or services that become an essential part of our daily lives. From websites like Facebook and Google. Entertainment services like YouTube and Netflix. Products like Apple’s iPhones and Mac computers. Anything around us is driven by a few companies that make up for most of our experiences. Yet we know a lot about those products and services, as we use them on a daily basis. But we know very few about how those companies work, what their back-end looks like, how they monetize, what keeps them going, and what makes them successful, what is their motivation and why they “act” the way they do. In the past years, I’ve been studying any business as a hobby, until I turned this passion into the FourWeekMBA. I’ve been quite surprised to find out how a few people know the way the companies that most influence their lives work. A few realize why those companies’ algorithms or organizations are structured the way they are. And how it all ties out to their bottom line and the motivation of their founders, shareholders and a core community around it. That insight made me want to dig deeper and deeper to dissect more and more companies, as I realized I could add a lot of value to more and more people. 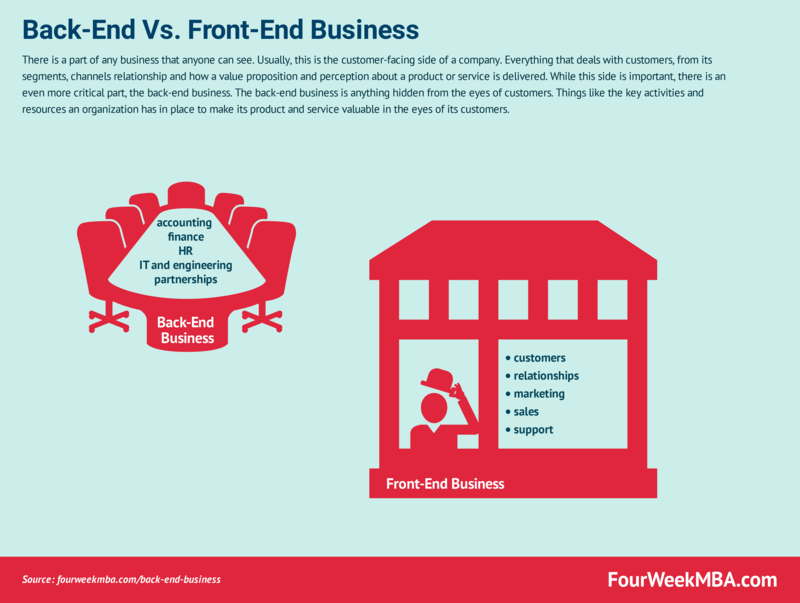 The first step to unlock this understanding is to grasp the difference between front-end and back-end business. There is a part of any business that anyone can see. Usually, this is the customer-facing side of a company. Everything that deals with customers, from its segments, channels relationship and how a value proposition and perception about a product or service is delivered. While this side is important, there is an even more critical part, the back-end business. The back-end business is anything hidden from the eyes of customers. Things like the key activities and resources an organization has in place to make its product and service valuable in the eyes of its customers. Other operational activities like inventory and manufacturing management, accounting and finance, distribution, IT and engineering, and human resources are all part of back-end business. This also implies the cost structure and partnership in place that makes the company able to thrive in the marketplace. And the way a business monetizes its resources. Front-end business is the first step to unlocking a clear understanding of the companies that most influence our lives. However, if you want to understand what motivates those companies, you need to open the hood and look under it. You’ll figure out things that you would have never imagined. For instance, would you imagine that a search engine like Google pays billions of dollars in partnership each year, to have millions of people going back to it each day? Do you know that Facebook makes 99% of its money from advertising? Or that Netflix spends billions of dollars on content production? That Google is still mostly owned by its two co-founders and Amazon is still mostly owned by its founder? And that Amazon lower its margins on purpose to accelerate growth? All those things you can know if you start looking at the business back-end. That is why on FourWeekMBA I devoted most of my focus on business modeling, business, marketing, and distribution strategies. When you do understand those key aspect of a business, you can say you grasped the business back-end of a company, which in turns might make you a better executive or entrepreneur. Previous Previous post: What Is The Difference Between A Business Model And A Business Strategy?